Hey there. 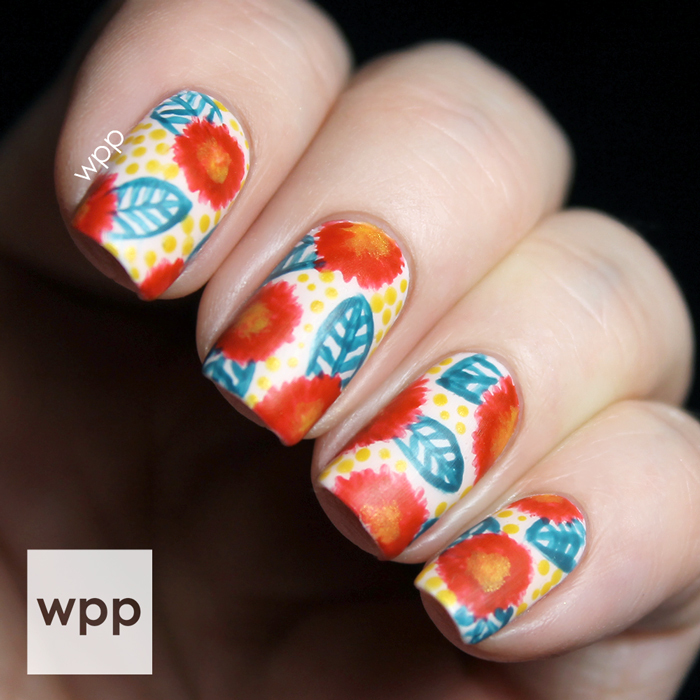 I have some Fall nail art today using a few shades from the Fall/Winter 2014 FALLing in Love Collection from Nubar. I first got to see this set at Cosmoprof North America. I love visiting the Nubar booth because they have so many other goodies besides nail polish...like over 50 varieties of non-fade nail gems! So I didn't have a big game plan for this design. I loved how the warm red (Love American Style), mustard yellow (First Date) and deep teal (Lush) looked all lined up together. They reminded me of mums. I started with a base of Nubar InstaChic, a super soft pink from the Nubar Social Butterfly Collection. I wish my base had been a bit more taupe, but I love this color on it's own. It's very opaque, but not chalky looking. From here I made my red, abstract mums with quick strokes using a nail art brush. Next, I added the leaves using Lush. And lastly, I stroked on yellow centers and created yellow dots with a small dotting tool. I finished with one coat of Nubar Diamont Top Coat (so the design wouldn't smear) and one coat of Nubar Matt Finish. I'm not in love with my leaves. I'd like to try this again with something less abstract. But I still love how the colors play together. Below are all eight polishes in the collection [Nubar bottle shots]. The addition of a shimmery pink and teal with this autumn mix of color is nice. Love American Style is a gorgeous red and First Date is a surprisingly wearable yellow, probably because it leans so gold. 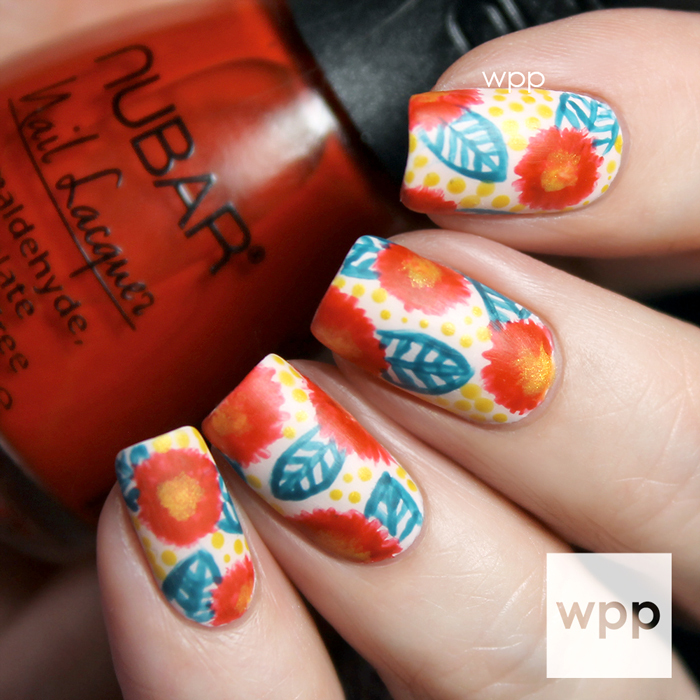 In my experience, Nubar polishes always separate incredibly in the bottle...but are like new with a good shake. The Nubar Fall/Winter 2014 FALLing in Love Collection is available now at www.bynubar.com for $8.40 each (note: their site was down as I was publishing this post). They also distribute internationally. Visit their International Distributors page for availability near you. Be sure to follow Nubar on facebook, twitter and instagram for news and promotions.